In the current technological climate, as prices fall and spec standards rise as they do, having a powerful graphics card is an integral part of working as a digital creative. With even your most mid-range laptops arriving with non-integrated graphics, and some even having more powerful cards than their package-built desktop counterparts, there’s really no excuse for not having a decent GPU in your daily-driver rig. While tech may be innovating at an astonishing rate, a good old GPU remains a staple. However, we really don’t have to fork out hundreds and thousands to get good performance these days. While you might be dreaming of a new RTX card that’s going to cost you a month’s rent, this is not necessarily the only option. Whether you’re doing animation, design, playing games or even just watching 4K movies, you can get some fantastic power and performance at a much more reasonable price from a cheaper card. Unless you’ve been hiding under a rock, this is probably information you’re familiar with. In this article, we’re going to look at this year’s best graphics cards for under $100. We’ve reviewed different cards from different manufacturers, with varying specs and abilities, in order to best showcase what GPUs under $100 have to offer. Let’s boot up and get those fans spinning! The ZOTAC GeForce GT 730 Zone Edition 4GB is our overall favorite for the best GPU under $100 for animation. While you probably know you’re not going to get a bomb upgrade to your animation rig with a $100 graphics card, this is still quite the baby beast. If you’re currently sitting with a less powerful or outdated card, you’re going to see a really nice jump in performance if you upgrade to one of these. Provided, of course, you have the necessary 8-16GB RAM, a decent processor, and an SSD. The NVIDIA GeForce GT 1030 OC 2GB is our top pick for the best gaming graphics card under $100. We chose it as our top pick for this category as it comes with some great features designed for gaming. These features include a full 4K / 60Hz Quad HD Output; one-click overclocking, as well as drawing very little power, and being quite customizable through Gigabyte’s included control software. The MSI AMD Radeon R7240 2GB is your best bet if you’re looking for a graphics card under $100 that you can easily run in Crossfire / SLI. This model, being AMD, supports Crossfire and allows you to run two graphics cards linked as one enhanced graphics processing unit. Further down in our review of the card, we talk about the pros and cons of this feature, and go into a little more detail. Here are our favorite 10 graphics cards under $100 that we reviewed. You’ll see each one has a handy pros and cons table, as well as some notable features listed for each, making it easier to understand and compare them at a glance. We’ve also listed a budget rating ($ – $$$) for each card, so you can see if it’s cheap, mid-level or pricey. 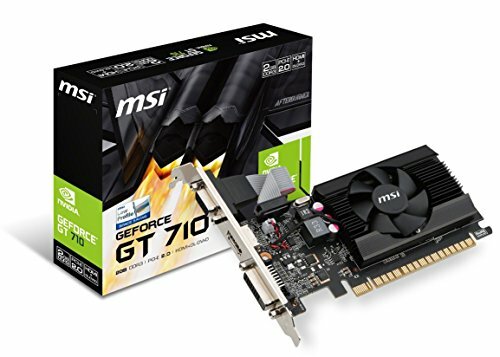 The GeForce GT 710 2GB from MSI Gaming is a solid, mid-range graphics card with a price well under the $100 mark. It’s a great daily driver, that supports just over 1440p display – quite a feat for such a cheap card, and one you would have paid around four times as much for a few years back. It’s got a great compact design, making it perfect for small stealth builds, or a homemade Steam Machine. It’s got Afterburner Overclocking Capabilities, and with 2GB DDR3 RAM, DirectX 12 and a 954MHz core. It’s great for design work, doing some basic animation, or playing some games at a decent quality level. Sure, you’re not going to be racking up 60fps on the latest Battlefield on Ultra settings, but with enough RAM, an SSD and a decent CPU, you’re going to be well-equipped to bring your setup up a notch, to the next level. It’s a simple, sturdy and well-rounded card that won’t leave you disappointed, adding a little kick into the mix. 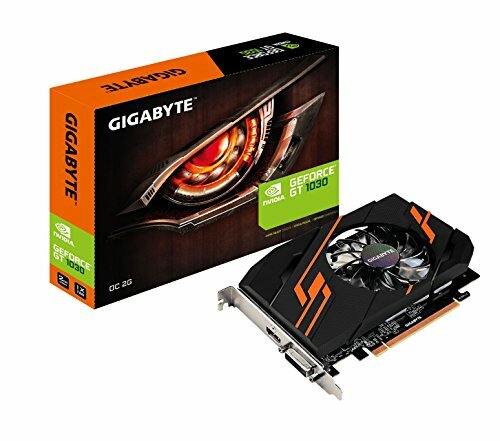 The GeForce GT 1030 OC 2GB is a powerhouse at a steal from Gigabyte, as far as we’re concerned. It’s got incredible power for such a small little card, and at less than double the price of the MSI GT 710, it’s got great bang for your buck. While small in form factor, the GT 1030 has some great features that one might only expect in a higher-end card. For this very reason, it’s our pick for our favorite GPU Under $100 for gaming. Some of these features include one-click overclocking, full 4K / 60Hz resolution, two gigs of GDDR5 RAM, and a whole host of possibilities in terms of tweaking and optimization using Gigabyte’s included command center. The card runs using very little power (running more than efficiently on a 300-350W power supply), and is built in the ATX form factor, with fans built to run silently and powerfully. It’s a great purchase if you’re looking to upgrade your gaming rig on a budget. It can also manage to hit 60fps on most non-AAA without much of a drop in graphics settings – this makes it a bit of an everyman in the budget gaming department. The GeForce GT 730 Zone Edition from ZOTAC is our top pick for a budget GPU under $100 for animation, as it’s got a whole lot of RAM and a decent processor too. It’s got a very small form factor, which is made up mostly of its heatsink (there’s no fan on this card) so be sure that your case has adequate cooling before setting your sights on this baby beast. The GT 730 4GB has a host of great features which make up for the lack of performance when it’s compared to newer, similar cards on the market. Some of these features include it being triple-display ready; using only 25-watts of power (meaning one can easily run it on a 300W power supply), supporting full 4K Quad HD resolution, as well as having a low profile form factor. Now, while this is a 4GB card, the memory is a little slower on this one, as well as the processor, compared to, for example, a 2GB GDDR5 card. This card is a little outdated and starting to reach a point of outdated performance. However, if you’re without a graphics card in your setup, or currently using one with lower performance and handling than this one, then it’s a no brainer to upgrade your animation rig with this little fighter. The GeForce GT 1030 SC from EVGA is a great card, and while it just about hits the $100 mark, you’re not going to find much better performance for the same price. It comes loaded with a fair bit of fast memory, a more-than-decent clock, as well as a whole host of NVIDIA support that comes included, such as NVIDIA GPU Boost 3.0, Vulkan API and many more. The card clocks in with 2GB of high-speed RAM, as well as being DX12 compatible, and has both HDMI 2.0b and DVI outputs. It has built-in 3D gaming support, and was designed to be used for 3D gaming as part of NVIDIA’s foray into that field. While 3D gaming hasn’t quite taken off as predicted, this build still makes the card great for standard gaming, as well as animation. You could also use it quite efficiently for video editing, and rendering when combined with the power of a good CPU. All in all, this card is quite a run-of-the-mill, powerful, yet reasonably-priced option. It’s also a bit of a do-it-all, in that you could use it for animation, gaming, video editing, or even just for a performance boost in your desktop overall. This little 1GB card from Asus really isn’t anything special – but that’s not to say it’s not any good. It’s basic, yet powerful for its size, and has quite good support for modern gaming and animation integration. While it’s not the most powerful card you’ll find for under $100, it’s one of the most reliable, and a great quality model at that. 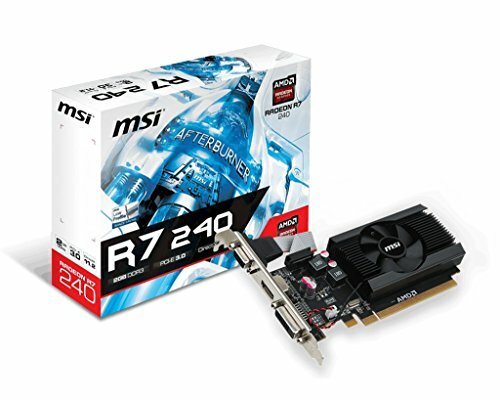 The Radeon R7 250 from ASUS comes with 1GB high-speed DDR5 Ram and supports a 2K resolution running DirectX 12. It uses a PCI-e 3.0 connector, and has a low profile form factor, and a dust-proof fan which increases the life of the card by up to 25% – quite a smart achievement, as far as we’re concerned, as we know how much of a killer dust can be. The card also comes with ASUS’ GPU Tweak II, allowing you to customize performance and capabilities on the fly, as well as their signature one-click gaming booster for an instant jump in performance and handling. This is a pretty simple and straightforward card, and is perfect if you’re looking for a basic, solid upgrade with no frills, a great build quality, and enough performance to handle all your day to day and basic creative stuff. Price is a little steep when compared to performance. While buying a graphics card from a relatively new or unknown manufacturer can always be a bit daunting, with the market for graphics card being dominated by a few titans. As such, many will avoid GPUs from brands they don’t know. 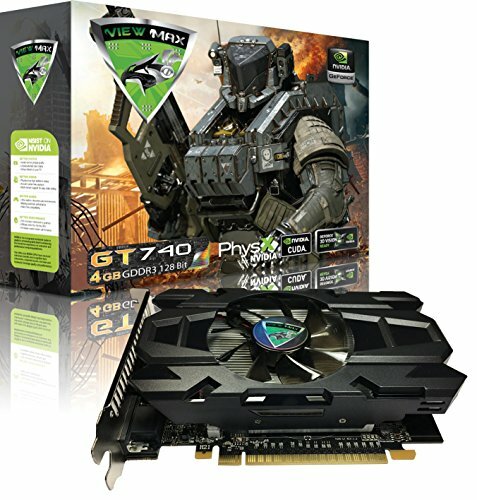 However, the ViewMax GeForce GT 740 is a card that defies these expectations. With a high-quality NVIDIA chipset and great specs, it’s a perfect example of why sticking to what you know best isn’t always the right move. 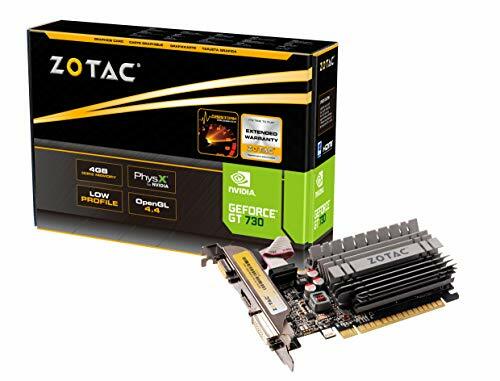 This card comes with a whopping 4GB of high-speed RAM, is compatible with the latest DirectX and OpenGL, as well as supporting all common output types in a 4K Full Quad HD resolution. It comes with all the frills of a top-end NVIDIA graphics card, such as NVIDIA’s adaptive vsync technology, unified architecture, PhysX and CUDA technologies. 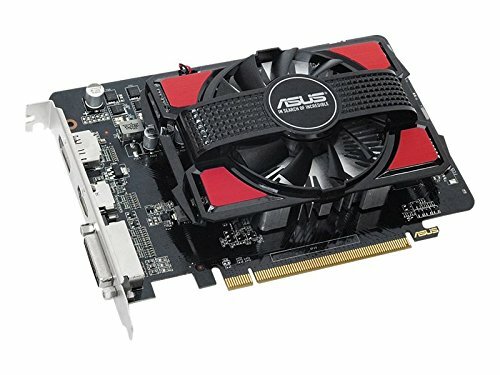 All these, in combination with the specs, help this card get the utmost performance capability on its budget-limited build. It would have otherwise been our pick for the best graphics card under $100 for gaming, had they included one-click overclocking and GDDR5 RAM. This is a fantastic card for its price, with features and support ensuring it won’t soon become obsolete, or stop being able to keep up with new developments in gaming, animation and design/video editing. If you’re looking for a strong, general upgrade within the price range of $100, as an overall performance booster, then this is undoubtedly the card for you. This simple little no-frills card made it to our list because it caught our eye when we learnt that it’s crossfire compatible – AMD’s equivalent to NVIDIA’s SLI. Which allows you to run two of the cards in tandem as one graphics unit. Now, many people use crossfire or SLI for different purposes, with some receiving better performance boosts than others. However, none of the other GPUs on this list had crossfire / SLI, and so this one stuck. It’s got a decent amount of RAM and a core fast enough that it won’t struggle with too much medium-to-high intensity jobs. It’s built for gaming, but many buyers also report it to be fantastic for video editing, and one could even use it for less-intense animation work, or the odd render. If you’re running two of these cards in crossfire (which would still somehow be under the $100 mark!) then be sure to do your research so you can best optimize the cards together, not sacrificing any performance in the process. Crossfire and SLI are, generally speaking, being moved away from in the industry, however they supply certain benefits you really won’t find in a singular GPU. All in all, this is a great card to go for if you’re hunting for flexibility or versatility, or if you already own one, and need a jump in performance but don’t want to upgrade. 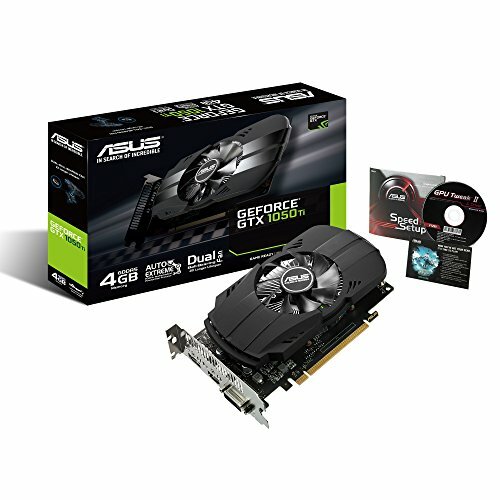 This GeForce GTX 1050 Ti from ASUS is quite a beast that sits just under the $200 mark, and is most definitely worth the extra budget if you can afford it. It’s got amazing build quality, and super high specs for a card at its price, and will boost your gaming, animation or any other visual experience to the next level in most systems. This GTX 1050 comes with 4GB of high-speed RAM, with a clock speed of 1290MHz, allowing you to get some great, high-speed performance out of it. It’s got a strong metal alloy build quality, as well as a dual-ball bearing fan which is meant to wear out slower, and last far longer. These in combination allow it to run up to 50% cooler than previous designs. It supports up to three simultaneous displays, and runs on an impressive mere 300W power supply. This is a great option for a powerful upgrade if you’ve got some extra cash to spend, and the tweaks one can achieve with ASUS’ included software allows you to angle and optimize the GPU to whatever task is at hand. This card is a slight downgrade from the ASUS GTX 1050 we mentioned just above. It’s got a slightly lower price point, half the RAM, but still outperforms most of the cards on the $100-or-less list. It’s a solid mid-range purchase that’s still close enough to the $100 mark, yet allows you a bit of wiggle-room to squeeze some extra performance out of it. 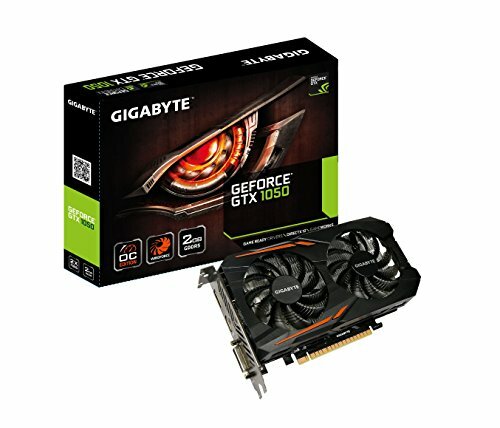 The Gigabyte GeForce GTX 1050 clocks in at a strong 2048MB of GDDR5 high-speed memory, with a clock speed of just over 1400MHz without using the boost function (which can get it up to around 1500MHz). It’s got a Windforce 2x Blade Fan design for easy cooling, especially if you don’t have a case with good airflow, and supports an 8K display at 60Hz. It also supports up to three outputs in multiview mode. All in all, it’s a solid card. It’s great for gaming, and will certainly help out with animation, video editing, and design. It’s a great purchase if you’re trying to stick closer to the $100 mark, but have a few extra singles to spend. 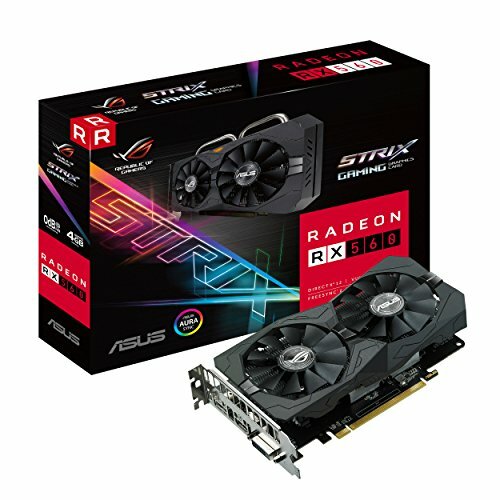 The ASUS ROG Strix Radeon RX 560 is a quality card that packs in a few extra features, sacrificing a drop in display size (still at an impressive 5K) and is a great upgrade to any computer system. It also features ASUS’ AuraSync Colour tech, allowing you to sync your graphics card lighting with any other ASUS components in your system. This makes it just about one of the cheapest custom-lit cards on the market. It arrives with 4GB of high-speed memory, and a clock speed of 1285MHz in boost mode. The DirectCU II fan technology offers a far quieter cooling option, which is 30% cooler and 3x quieter than previous ASUS models – a plus for some of us who like to display our rigs on desks, but are bothered by constant white noise in one ear. It supports a 5K resolution over a maximum of three displays, making it ideal for a multi-monitor setup on which you still want to achieve good performance. The power requirements for this card are a little higher than that of the others on this list, with a minimum recommended PSU of 400W, but that’s a small sacrifice to make for such a well-performing card. 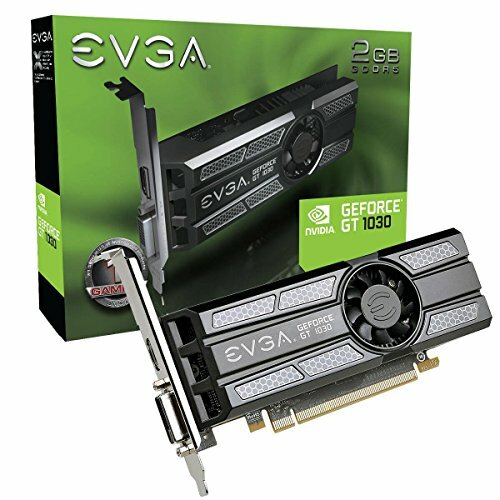 This GPU is a solid choice for anyone looking for a general upgrade, something with pretty lights, or happy to sacrifice an 8K display for a bit of a drop in price. It’s quite easy to find a good graphics card under $100, and we think we’ve shown this to be true with the varied list we’ve provided here. However, it’s still a tricky task to decide which of the bunch is the best for you. This depends on a number of factors, such as your existing computer specs, what kind of work you’re doing, and how much you have to spend within the $100 range. Here’s a little buyer’s guide for picking the best graphics card under $100. There are a few things to consider when picking from a long list of GPUs which are all quite similar in terms of their performance and abilities. Here are some pointers we’ve put together in an order that we think helps eliminate units that won’t work for you, leaving you with a refined selection of graphics cards built to your needs, that you’re still able to choose between. Size is probably the most important factor in buying GPUs under $100. Many of these kinds of GPUs are built to certain sizing standards, such as ATX motherboards or Low Profile cases. There is no worse feeling than arriving home to a fresh package of tech upgrade, only to realise that it doesn’t fit in your setup – so be sure to have your case’s measurements and connector types on hand when shopping to avoid little mistakes that will throw off your whole upgrade. While most of the cards on this list require a mere 300-350W power supply, and it’s unlikely anyone reading this has a power supply with a lower wattage than that in this day and age, it’s another factor to double check. If you’re running a very basic low power supply, then you might even want to try to find a package deal to get a new PSU and GPU together at a discounted rate. You’re also going to want to consider how loud the card is, and how much cooling it needs. For most people, a little bit of fan noise is a worthy trade-off for an upgrade in performance, and most graphics cards can cool themselves decently with a quiet fan at around 30%-50% speed. However, some of us are pickier than others, and need quiet. In other cases, cheaper graphics cards might not come with a fan, and rather just a heatsink, meaning you need to ensure your case is properly ventilated, leaving no room for dust or heat build-up to occur. This can be a tricky process, but is most certainly something you can set up yourself. Lastly, you’re going to want to take a look at the specs of the card. The clock speed, the amount of RAM, and perhaps some benchmark tests to see how it performs in comparison to other cards. If you’re running a system with an outdated i3 processor, and no RAM, then you’re not going to see the performance boost you want, even if you were to go for an RTX card. With modular computer systems, it’s all about eliminating the bottleneck. So, you’ve upgraded your graphics card, but you’re still not seeing as much of a boost in performance as others experienced? Well, it could be a number of issues – such as system optimization and age – but it’s most likely the other parts in your system. Firstly, an SSD is a great upgrade to start with to eliminate that all-too-common typical ‘slow computer’ feel. While SSDs can be expensive, they’re almost more important than a CPU or GPU in an upgrade, as they allow the whole system to run faster, to a degree. They’re eliminating any bottlenecking happening in terms of storage, allowing you to expand outwards faster with your other parts, and do so more precisely. RAM is another easy way to get some life back into a system that’s starting to slow down. In fact, you’d likely see a more immediate and recognizable boost in performance by upgrading RAM and the SSD instead of the GPU – so consider this carefully. RAM generally works on a basis of equal numbers, so if your system has 4GB RAM, upgrade it to 8GB. If it’s got 8GB, don’t add another four to get to 12GB, but rather match the existing 8GB to get it up to 16GB. Lastly, and least conveniently is the possibility that your processor, the brain of the computer’, is slowing everything down. This is a tough cookie to swallow, as unless you were super clever and careful when choosing your motherboard, you’re likely going to have to get a new one, and reinstall your operating system if you’re upgrading your processor. This can be a lengthy and tiring process, but is definitely worth it if you’ve exhausted all other options before this. It also just feels great to start with a freshly wiped, clean and new system. If you’re going the route of a CPU upgrade, we’d recommend looking for upgrade kits that come with a motherboard, CPU and RAM as you’ll have far fewer headaches trying to pick out the right parts, as well as likely save a few bucks here and there. You should now be more than well-equipped to pick out a new graphics card that costs less than $100. We’re confident there’s at least one on this list that’s perfect for you, and we hope you enjoy a boost of speed, visuals and (hopefully) productivity with your upgraded system. Don’t forget to share your two-cents about what you think of the cards we reviewed, and please do let us know if you think we left out a graphics card under $100 that’s absolutely killer.